DEBBIE SWANN graduated from Kansas State University with a B.A. in Theatre and English. From there, she earned her Master's in Theatre with a Directing emphasis from Texas State University. She has trained in England at The Shakespeare Center, The Academy of Dramatic Art and The Royal Shakespeare Company. Before moving to Colorado, she taught, designed and directed theatre at Central Community College in Columbus, Nebraska. Some of her favorite directing credits include Rumors, A Funny Thing...Forum, Rosencrantz and Guildenstern are Dead, Tartuffe and Godspell. 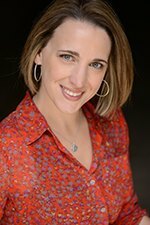 Debbie joined the Theatre Department at Colorado State University in 2013 and teaches Shakespeare as well as Introduction to Theatre. In partnership with CSU and Kaiser Permanente, Debbie directed The Amazing Food Detective, which toured elementary schools around Northern Colorado. With OpenStage, Debbie directed Steel Magnolias and Bright Ideas and appeared in Spring Awakening (OpenStage OPUS Award), the Henry-nominated Don't Dress for Dinner and And Then There Were None. She looks forward to working with OpenStage for years to come.